There is this difficult story in Matthew’s Gospel about a slave who owed a staggering sum of money – something probably in the neighborhood of sixteen years wages for a worker of the time. The king to whom the debt was owed put the ledger into the shredder and forgave the account. But the slave then promptly imprisoned a fellow who owed him about three month’s pay – a much shorter ledger. The king’s reaction to this was to turn the slave over to torturers to (literally) take the forgiven debt out of the man’s hide. This notion of trapping myself with the debts I insist on collecting turns up elsewhere. It’s in the Lord’s prayer and is not some aberration in Jesus’ teaching. I am unable to avail myself of the grace of God because I cannot extend grace to others. The death and resurrection of Jesus is supposed to be good enough to reconcile God and man. But for some reason it’s not good enough for reconciliation between me and other brothers and sisters. There is no way for that fellow slave to ever pay back the three months wages. And the fact that I had to hunt him down is what was really galling. He did not come to me. My suspicion is that the debt would never have even been acknowledged until the debtor was cornered and begging. But now that I’ve somehow gotten the upper hand I am not inclined to show mercy until all the debt on the list is accounted for. 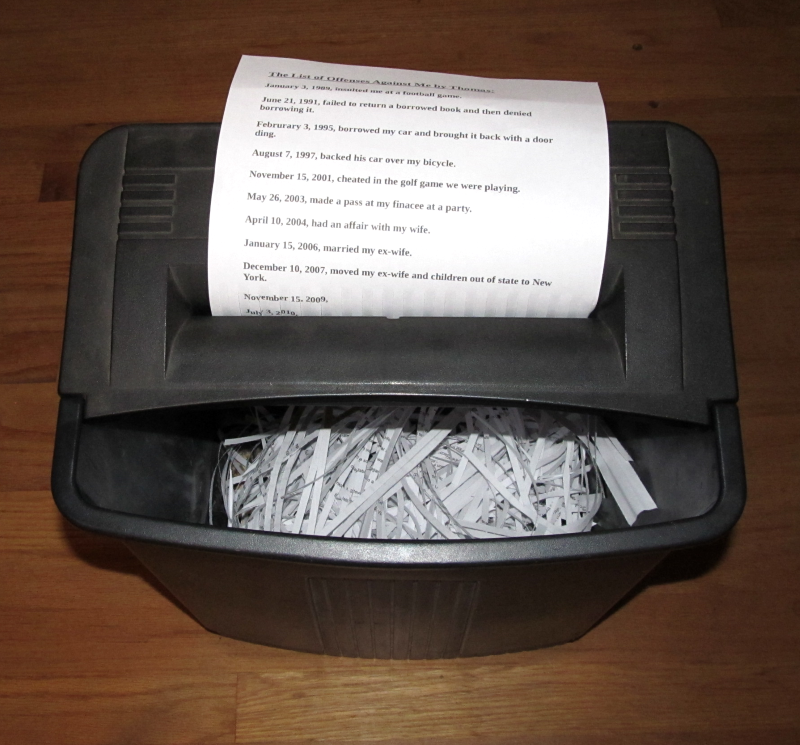 Shredding a list does not mean that there are no boundaries set to fence off someone else’s dangerous or destructive behavior. Spouses are not obligated to live with abusers and addicts. Rather, destroying a list is about forgoing the desire that the other person to “pay up” in some fashion. If not to make it right, to at least acknowledge the debt, particularly the real injury that may have been done. Letting go of the record of debt is essential to reconciliation. But keeping such records is lethally poisonous to personal relationships. Except that the list is only toxic enough to mostly kill them. There are people we know and may have once been friends with that we would rather never see again. Unfortunately the relationships are still twitching and mobile because the memories and chance encounters still hurt. Those personal connections have become animated corpses and it doesn’t matter how many times we hit the zombies with the shovel. They just keep coming. Such walking dead things cannot be “healed.” We’ve successfully trapped them on the wrong side of the resurrection. Jesus gave outsiders the right to judge the credibility of Christian witness by how we treat each other. Unfortunately the broader culture doesn’t find anything particularly attractive about some of our rotting relationships. The resurrection is about transformation. Those decayed things need transformation into something new. But this won’t happen until we let go of what’s owed us, and the lists we keep go into the shredder.